I came across this CNBC article yesterday titled, Decade after housing crash, Fannie Mae and Freddie Mac are Uncle Sam’s cash cows, and it got me thinking about the concept of government intervention in the marketplace. Agencies like Fannie Mae and Freddie Mac keep mortgage rates much lower than they should be. How do their actions affect housing supply and prices? Higher education – If the government promotes easy access to college student loans the result will be higher tuition for all involved. Lending banks, colleges, and textbook publishers benefit the most. Healthcare – If the government establishes health care subsidies and programs like Obamacare, Medicare, and Medicaid the result will be higher medical care costs for everyone as the demand curve shifts out and further to the right. 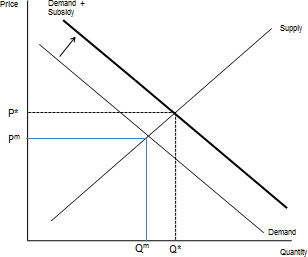 In addition, the supply curve moves up and to the left as the added government regulation places a burden on the health care provider. If the consumer is not directly responsible for his or her health care costs these programs encourage moral hazard behavior. The largest healthcare providers benefit the most as the government red tape crowds out all but the largest players. An oligopoly is the end product. The concept of owning a home in the United States has been a primary objective of the federal government since the Great Depression, and there have been a number of agencies established to further this agenda. The most important of these agencies are the government-sponsored enterprises GSEs, such as Fannie Mae and Freddie Mac, as well as the Federal Housing Administration. The Federal National Mortgage Association (FNMA), commonly known as Fannie Mae, is a United States government-sponsored enterprise (GSE) and was founded in 1938 during the Great Depression as part of the New Deal. The corporation’s purpose is to expand the secondary mortgage market by securitizing mortgages in the form of mortgage-backed securities (MBS), allowing lenders to reinvest their assets into more lending and in effect increasing the number of lenders in the mortgage market by reducing the reliance on locally based savings and loan associations (or “thrifts”). Its brother organization is the Federal Home Loan Mortgage Corporation (FHLMC), better known as Freddie Mac. “Forget shareholders, forget stock speculators, for the rest of the marketplace, the one thing that is keeping [interest] rates lower than they’d otherwise be is this conservatorship,” said Dave Stevens, who recently retired as president and CEO of the Mortgage Bankers Association. Another problem with government intervention in the mortgage underwriting sector is that there is little incentive for mortgage underwriters to accurately gauge a borrower’s risk profile. As long as a mortgage can conform to Fannie Mae or FHA guidelines the borrower will get his or her loan to purchase a home. In addition, this explicit government-backing creates a guarantee against default; cultivating an incentive for moral hazard behavior by the lender and underwriter. Why worry about default if the government will backstop the loans? Let’s just maximize our loan underwriting and we can actively advertise. Without the assumption of default risk, lenders and mortgage back securities investors will accept a lower rate of return (i.e. lend to borrowers at lower mortgage rates than what the free market would normally bear). This creates excess demand as borrowers can now borrow at lower rates than they could get without government intervention. Lower mortgage rates creates a subsidy which drives excess demand. House prices will always be higher. Wow! The Feds effectively control the entire mortgage market. They are backing up to 90% of mortgage underwriting. As long as house prices continue to rise, then the moral hazard mindset of not being held accountable for the long-term ramifications of short-term underwriting decisions is not a major issue. But if house prices stumble we could see another bust cycle as much of the excess demand in the housing market created by artificially low mortgage rates could end up becoming excess supply. interest rates would be higher (not just in the mortgage market, but in the entire credit market). The rates would reflect the true market place risk. prices would be much lower. Unfortunately, as long as the federal government controls the debt markets and especially, the mortgage market, we will never know what true equilibrium in the housing market looks like. Keep in mind that those who are pumping up the current system and are its biggest promoters are the people who have the most to gain from the status quo.